PLAIN SLICED VENEERS : LOG IS CUT IN HALF LENGTHWISE. EACH HALF IS THEN SLICED LENGTHWISE PRODUCING A VENEER WITH A UNIQUE GRAIN PATTERN. RIFT CUT VENEER : LOG IS CUT INTO QUARTERS LENGTHWISE THEN SLICED AT A 90-DEGREE ANGLE TO THE GRAIN. THIS PRODUCES A PENCIL FINE STRIPE EFFECT. BOTH PLAIN AND RIFT SLICED VENEER ARE RESERVED FOR HIGH-GRADE PLYWOOD PANELS ONLY "FANCY". QUARTER SAWN VENEERS : THE QUARTER LOG IS MOUNTED SO THE GROWTH RINGS STRIKE THE CUTTING KNIFE AT RIGHT ANGLES. THIS PRODUCES A SERIES OF STRIPES IN THE VENEER. 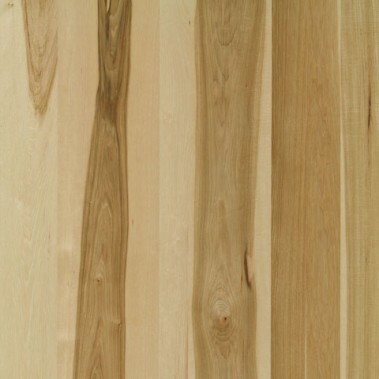 CHARACTERISTICS : Sapwood varies from soft pinkish white to light yellow to light khaki in color. Surface is smooth, tight, and dense. Heartwood ranges from dark brown to green to black. Typically sold as white maple. Growth rings are light and at times imperceptible. Susceptible to insect assault resulting in brown streaks called worm track. CHARACTERISTICS : Heartwood varies from dark tan to deep chocolate depending on amount of exposure to air prior to drying. Grain varies from very straight to interlocked which produces pronounced figure that may or may not be desirable. Pin knots with small dark centers may be prevalent. COMMON CUTS : Plain sliced, Quarter sliced (usually pulled from sliced) Uses: Architectural millwork, judges panels, parquetry, musical instruments, fine furniture, cabinetry. BDD STOCKS : PLAIN SLICED - 4' X 8' PANELS - 1/4" B-4 + 1/2" B-2 + 3/4" B-1THICKNESS / GRADES - PUREBOND POPLAR CORE OR MDF CORE. SPECIAL ORDERS WITH LEAD TIME ON ALL OTHER SIZES, CUTS, AND THICKNESSES - 10 PC MINIMUM IF LESS THAN FULL UNIT. NATURAL BIRCH : LIGHT TAN TO PALE YELLOW SAPWOOD WITH RED TO RUDDY HEART WOOD. GRAIN IS TIGHT AND SMOOTH WITH NORMAL AMOUNTS OF FIGURE AND OTHER CHARACTERISTICS. PRIMARY USES : DECORATIVE VENEER AND LUMBER PRIMARILY FOR KITCHEN CABINETRY AND FURNITURE. COMMONLY USED IN LIEU OF MAPLE OR POPLAR WITH SIMILAR PRICE POINTS. CHARCTERISTICS : Pink to reddish brown heart wood, blonde sap wood. Tight grain minimum early wood. Gum, pin knots, and burls are prevalent. Figure is common and may include heavy patterns such as ropey, mottled, chevron, and flare. CHARACTERISTICS : Sharp contrast between coarse early wood and smooth late wood. Heartwood color is light tan to pinkish to reddish brown to dark tan or khaki. Large rays produce pronounced flake appearance across the grain when the wood is quarter sliced. Rift cutting minimizes the flake appearance. USES : Kitchen and bath cabinetry, furniture, architectural millwork, wall paneling, casework, molding, flooring. CHARACTERISTICS : Pale yellow sapwood with light brown to reddish brown to gray brown heartwood. Some moderately coarse early wood, but otherwise hard and smooth. Some may contain color variation, color streaks, and rustic marks like worm track and bird peck. Same genus as Pecan. BDD STOCKS IN 3/8" OR 9MM IN BOTH BARREL AND COLUMN BEND. 3 PLY CONSTRUCTION - MAXIMUM RADIUS OF 12", MAYBE ABLE TO FLEX SMALLER BUT WILL REQUIRE SIGNIFICANT FORCE. ALL COMPONENT PARTS SHOULD BE MANUALLY FLEXED TO ATTAIN MAXIMUM FLEXIBILITY. APPLICATIONS : USED FOR CURVED APPLICATIONS WHICH WILL BE HIGH PRESSURE LAMINATE, PAPER BACKED VENEERS, OR OTHER THICK SURFACES. PANELS ARE NOT DESIGNED FOR EXTERIOR OR STRUCTURAL USE. SOME SITE SANDING MAY BE REQUIRED. BENDING BARREL : 8' X 4' - 3/8"
BENDING COLUMN : 4' X 8' - 3/8"